On to my third model railway exhibition in three weeks. Uckfield was another excellent show. It was a contrast to Farnham. Farnham was larger with more larger layouts. 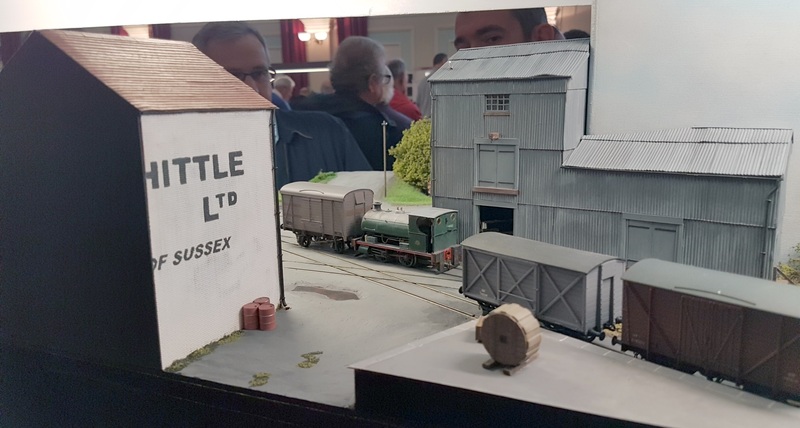 Uckfield seemed to have more small layouts. There were a few old favourites, but some layouts that I hadn’t seen before. I haven’t taken pictures of all the layouts on show, but just those that impressed. Arun Quay is Gordon & Maggie Gravett’s latest masterpiece in ‘O’. It’s small enough to travel by car, and when I was there featured a ‘Terrier’ shuffling a few wagons around. But the Gravett’s forte is the scenery, and this model captured the River Arun and the Sussex coast perfectly. 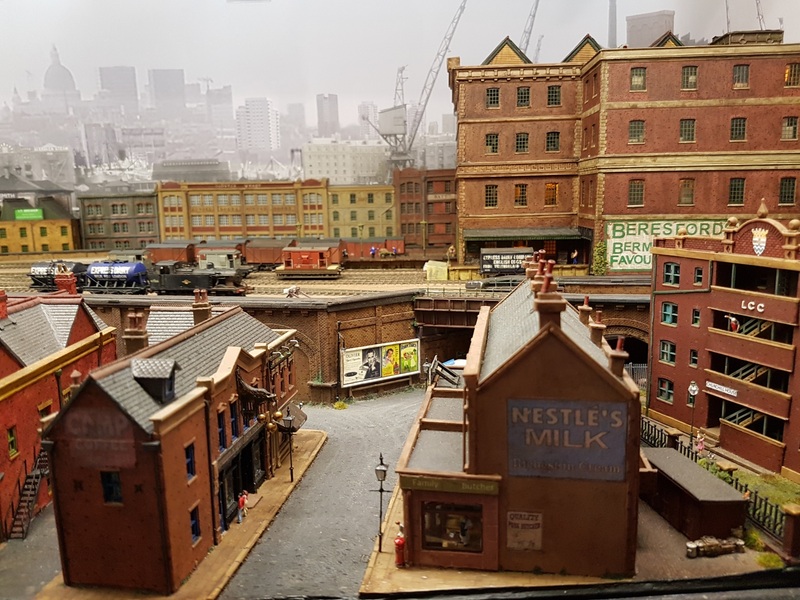 The buildings are small, but all scratch built and the whole scene conjures up a bleak day on the Sussex Coast. I’d read Olly Turner’s blog so it was good to see ‘Six Quarters’ (not to be confused with Fork Handles) in the flesh, or rather grot and grime. Another simple layout, in ‘OO’, based in the 1970’s when the National Coal Board were still running steam locos. Once again, the locos pushed around a few wagons, in this case rusty opens full of coal. I had seen Trevor Nunn’s ‘Trowland’ before, but it was well worth another look. It’s in ‘S’ and based on the old M&GN railway and its predecessor – a rare prototype to see modelled. 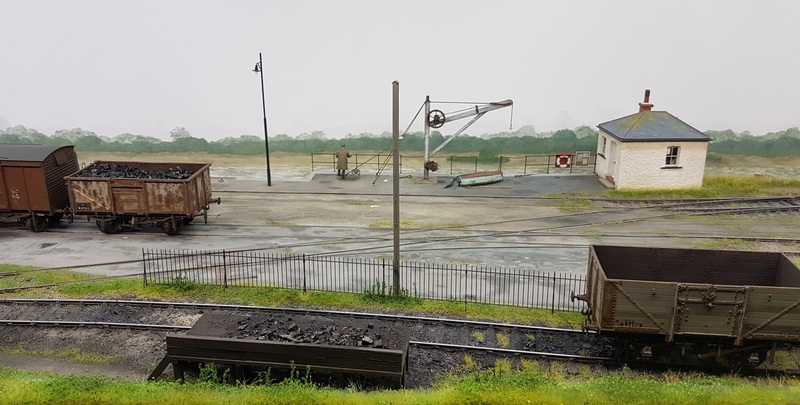 Another small layout, this has, I think, replaced Trevor’s wonderful (and much larger) model of the GER in King’s Lynn. However, there’s no doubt that Trowland is a lot easier to transport and set up. It does seem to bear some resemblance to Iain Rice’s seminal ‘Butley Mills’…. 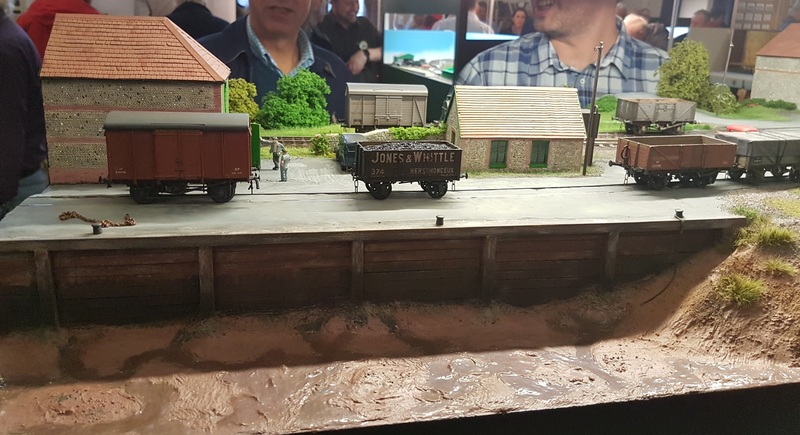 Tom Everitt’s ‘Ropley’ is a model of a small part of the Mid-Hants Railway, in preservation days. It shows what can be done in ‘N’ gauge, making the permanent way look far more realistic by using hand built points and code 40 rail. I really liked Tarring Neville, in ‘OO’. 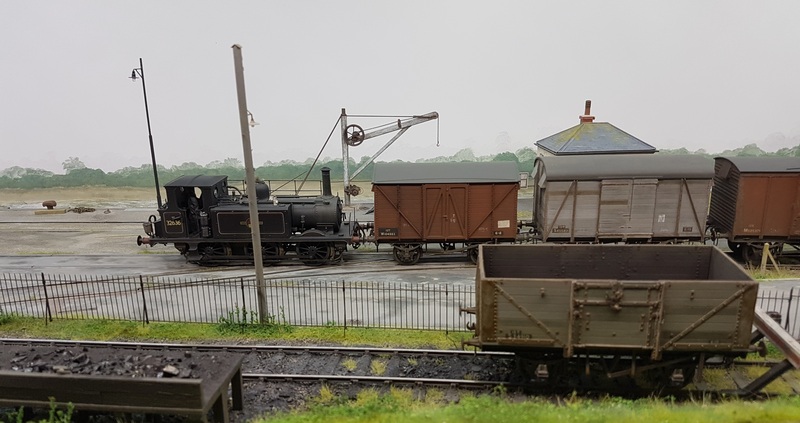 Again set in Sussex, this industrial railway is interesting in that it can be viewed from three sides, and each view gives some new perspective on the scene. The buildings are used as effective view-blocks between these scenes. Now for some old favourites. Wiley City, in ‘HO’ is Andy Gautrey’s minimum space but fascinating model of the Yakima Valley interurban line, in Washington State, USA. The overhead works, and power is through the trolley poles. When I was there, they were attempting some ‘pole shunting’ – pushing a boxcar on the parallel track using a baulk of timber. And it worked…..
Sidmouth in P4 is another fine layout, a large model of a small LSWR branchline terminus. I was able to get this shot of the houses on Station Road – the station is on the right, that capture these large residential houses to perfection. 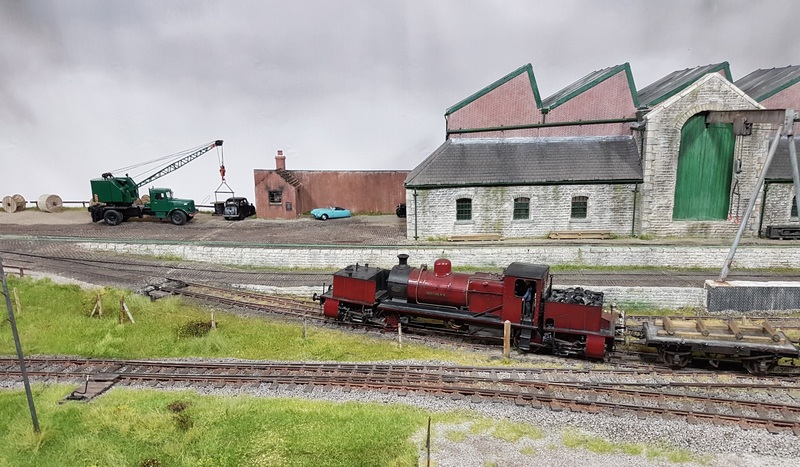 Moving on from Farnham was ‘Denton Brook’ in ‘O’, but I couldn’t resist a photo of this 0-4-0 0-4-0 industrial garratt, and the working radio controlled crane in the background. And finally, a different perspective on ‘Lightermans Yard’ (2mm FS). I’ve one more layout to describe, but this will be in the next post. 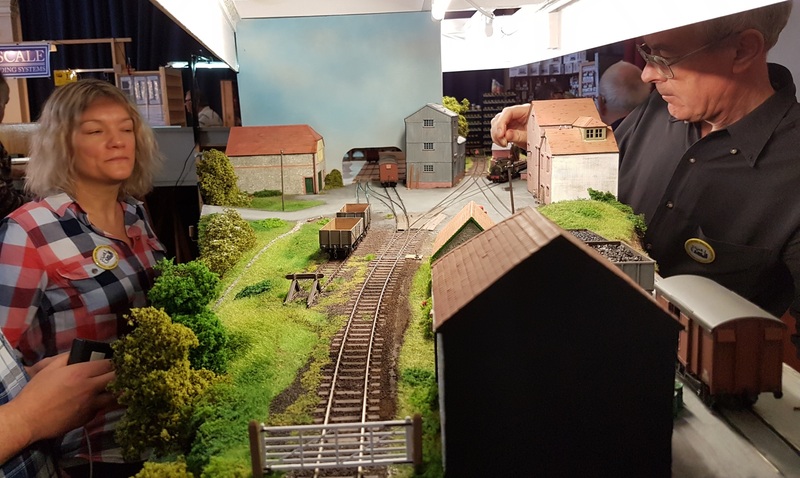 This entry was posted in Exhibitions, Inspiration, Layout design, Out and about and tagged exhibition, model railway, N gauge. Bookmark the permalink.